Prairie dogs are robust rodents, slightly grizzled and fat. They have broad, rounded heads, hairy tails and short legs. The skull has 22 teeth. Prairie dogs weigh 1 1/2 to 3 lbs. The head and body are 11 to 13 inches long, with a tail length of 3 to 4 inches. They are yellowish in color, with darker ears and a pale buff to whitish belly. Prairie dogs have whitish or buffy patches on the sides of their nose, their upper lips and around their eyes in the form of a ring. Throughout most of the western United States from Canada to Mexico — Montana, the Dakotas, Nebraska, Kansas, Oklahoma, Texas, New Mexico, Colorado, Arizona, Utah, and Wyoming — including higher elevations of the Mojave, Great Basin and Chihuahuan deserts. View a short video on Prairie Dogs. Black-Tailed Prairie Dog (C. ludovicianus) occupies narrow bands of dry plains stretching from central Texans to Canada. White-Tailed Prairie Dog (C. leucurus) inhabits Western US: Colorado, Utah, Wyoming, and Montana. 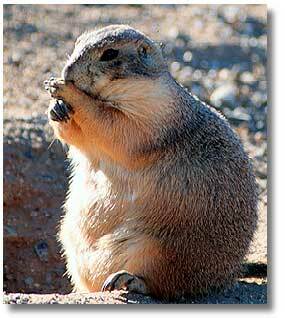 Gunnison’s Prairie Dog (C. gunnisoni) has a much shorter tail than other prairie dogs. It is uniquely colored and centers around the Four Corners area at elevations from 5000-11000 feet. Mexican Prairie Dog (C. mexicanus) is an endangered species with a limited distribution. It is only found within parts of Mexico. Utah Prairie Dog (C. parvidens) is the smallest of all prairie dogs and threatened. Of the two main species of prairie dogs, the black-tailed (C. ludovicianus) has a black-tipped tail and is much more widespread, occurring sparsely over the Great Plains and throughout the Great Basin. Black-tailed are the prairie dogs normally sold in pet shops and may either be a baby caught in the wild or from a breeder. The other main species, the white-tailed prairie dog (C. leucurus), has a white-tipped tail and inhabits higher altitudes than the black-tailed. It hibernates in winter and is less colonial in habit. Prairie dogs have a high-pitched, bark-like call. Recent studies suggest that prairie dogs possess the most sophisticated of all natural animal languages. They apparently issue different sounds identifying various predators, which include hawks, owls, eagles, ravens, coyotes, badgers, ferrets and snakes. Prairie dogs can run up to 35 miles per hour for short distances. The prairie dog has only one defense that works — raising the alarm and disappearing quickly. Prairie dog tails are generally short and bushy, but vary considerably in length and color between species. Prairie dogs’ ears are very short and often hidden in the fur. Prairie dogs’ eyes, which are positioned on the sides of the head, appear to be adapted for detecting movement over a wide arc; this allows the detection of predators with greater success. Prairie dog’s feet are a usually a creamy color. All prairie dogs are diurnal. While most may be dormant for short periods of cold weather, the white-tailed species is a true hibernator in winter. Prairie dogs have an intricate social system composed of one male and several close-kin females and their offspring. Populations vary from 5 to 35 per acre. The prairie dog digs its own burrows. There is a well-constructed and frequently reinforced dike against flooding from sudden rains. The entrance holes themselves are funnel-shaped, from 3 to 4 inches in diameter. These tunnels lead down a steeply slanting corridor 15 or 16 feet before leveling off for another 20 to 50 feet. There are side chambers for storage, for nesting and for escape should the tunnel be invaded by predators or flooding. They may extend 100 feet or more. When a predator approaches, the first alert prairie dog gives a sharp warning call, bobs up and down in excitement, calls again and then plunges below. The danger signal is a 2-syllable bark, issued at about 40 barks per minute. Other sentinels farther from the danger zone take up the watch, monitoring the course of the predator. Short and medium grass prairies and plateaus of the American West. Although prairie dogs are almost exclusively vegetarian, nursing females have been observed both cannibalizing and communally nursing each other’s pups. The various native plants of the Great Plains make up the prairie dog’s primary diet, comprising all kinds of grasses, roots, weeds, forbs and blossoms. They acquire all of their water from the food they eat. Sometimes insects are also eaten. One litter is born to the prairie dog female each year. During a 4- or 5- hour estrus, a female prairie dog may mate with as many as 5 different males, allowing pups from the same litter to have different fathers. For the black-tailed, mating generally occurs in late January, with the young being born in March and April (a gestation period of 28 to 32 days). The white-tailed mates in March or April, with the young being born in May. These youngsters hibernate with their parents October through March in the north and in high mountain valleys. There are usually 3 to 5 youngsters in a litter, but sometimes as many as 8. The young are blind and hairless. Their eyes don’t open for 33 to 37 days. At about 6 weeks, they begin to appear above ground and are ready to be weaned. They probably separate from the mother by early fall. During May and the early part of June, the young begin to emerge from their burrows for the first time. At this time, yearlings (young from the previous year) and some adults may relocate, leaving the young pups to feel secure both socially and environmentally in the old burrow. 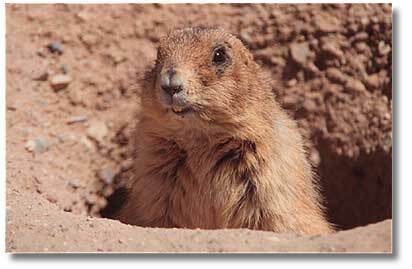 When prairie dogs relocate, they take over abandoned holes or dig new holes at the edge of the town. A few may travel miles in search of new areas, but once away form the communal warning system, most are easy prey for predators. Common predators of the prairie dog include coyotes, bobcats, eagles, hawks, badgers and weasels. Because they eat as much as 7 percent of a ranch’s forage, prairie dog eradication programs have been underway for decades in the American West. But a growing number of experts argue that prairie dogs may actually be beneficial, that they are natural fertilizers who also increase the protein content and digestibility of rangeland grasses. Today, after decades of eradication by federal, state, and local governments, devastation from disease, poisoning, recreational shooting and habitat destruction, prairie dogs are rapidly disappearing. More have been exterminated than remain, inhabiting only about 2 percent of their former range. Colonies are being preserved, however, in Wind Cave National Park, Devils Tower National Monument and in the Wichita Mountains Wildlife Reserve. The city of Santa Fe, New Mexico maintains a municipal park with a resident colony of Gunnison’s prairie dogs. Prairie dogs are very susceptible to bubonic plague, acquiring it from fleas infected with plague bacteria. Most public health officials believe the chance of contracting plague from prairie dog fleas is very low, but flea-borne disease can wipe out a colony. Prairie dogs have lived up to 8 1/2 years in captivity. Prairie dogs are stout, burrowing rodents among the many varieties of ground squirrels. Most prairie dogs hibernate during the winter. Settlers called them “dogs” and “sod poodles” because of their high-pitched, bark-like call. As members of the genus Cynomys (Greek for “mouse dog”), all 5 species of Prairie Dogs belong to the squirrel family (Sciuridae). Prairie dogs issue different sounds identifying various predators, which include hawks, owls, eagles, ravens, coyotes, badgers, ferrets and snakes. At the turn of the century, as many as 5 billion prairie dogs occupied millions of acres of grass prairies across the West. In 1900, a huge prairie dog settlement, 100 miles by 250 miles, was reported on the high plains of Texas containing an estimated 400 million prairie dogs!